Before you even think of taking your fishing skills to a whole new level, you need to make sure you have the right kind of gear in place. One must-have gear is the fishing kayak. The watercraft comes in handy in helping you access the deep waters for some quality time. Besides that, you can look forward to owning a kayak that comes with lots of dry storage compartments. Such can come in handy in helping you store your baits, lures, fish finders, and even reels. With that mentioned, we’d like to walk you through some of the best fishing kayaks under $500. Hopefully, you’ll find something that’s just enough to get you started in your fishing water trips. For a scoop of what to expect in the detailed reviews, here’s a quick comparison table. This one will, hopefully, help you make an informed choice. Sundolphin Journey is the perfect watercraft for kayaking adventures in both lakes and rivers. It features an affordable one-person sit-on-top cockpit that is pretty comfortable. Besides that, it has a 250lbs weight limit which provides it with adequate, one-person sitting capacity. In addition, the Journey 10 is one of the easiest yaks to maneuver around thanks to its streamlined design. And, therefore, you can confidently use it to access exclude fishing spots. The kayak is constructed from Fortiflex high-density UV-stabilized Polyethylene. The material makes the kayak strong and, therefore, durable. It has ample storage space for rods and for your tackle and gear. The yak further comes with one swivel rod holder and two flush mount rod holders. A special mounting bracket for your rods means you can have a hands-free kayaking experience sometimes. There is also a water bottle holder, storage compartment and the shock cord deck rigging that can also be used for storage. This watercraft has a large cockpit for easy boarding and getting out. For your comfort, it has padded seats, adjustable foot braces, and protective thigh pads. Emotion XT kayaks are manufactured in the USA. It is quite an easy-to-operate watercraft, making it suitable for both newbie and veteran kayakers. It is a one-person sit-on-top kayak weighing 49lbs and 10 feet long. Its maximum weight capacity is 275 pounds. Though it is not so long, it is wide at 36 inches making it stable on the waters. The watercraft is quite spacious, making getting in and out easy. The kayak is constructed from High-Density Polyethylene for durability and strength. For your paddling comfort, it has a removable seat which has a good backrest and several footwells. The kayak comes with ample storage space, and you don’t need to be so limited on what to carry. It has two flush mount rod holders. You can use the solace hatch below the deck for storage. There is also a sizeable rear tank behind the seat and also more deck space storage. This yak is quite portable. It is light and comes with front and rear handles. It has scupper holes for draining water from the watercraft. It is priced under $500, and the hull comes with a three-year limited manufacturer’s warranty. Unfortunately, it is currently available in only one color, olive green. Also read: 20 Best Fishing Shoes for Men & Women – Top Models Reviewed! & Best Baitcasting Reel Under $100 - See Our Top 10! 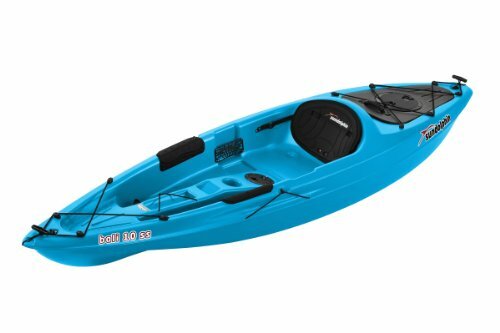 Sea Eagle Inflatable-SE370 is one of the best inflatable kayaks that gives you the opportunity to share kayaking fun with a small family. It is a quite stable watercraft able to handle up to Class III whitewater. You can, therefore, do many exhilarating escapades in both salt and fresh water including skin diving, fishing, white water rafting, paddling, yacht tending, among others. It is constructed with durability with a salt and sun resistant hull. The yak comes at quite an affordable price with many accessories. The order package includes two paddles, a foot pump, a repair kit, and a carry/storage bag. The package, therefore, saves you money you would have used to buy those extra accessories. It is a three person kayak that comes with a maximum weight capacity of 650 lbs. Worth noting is that the yak is flexible and can be operated and carried by one or two people, not necessarily three. The kayak comes with enough storage space for your items. The kayak is quite portable, weighing at 26 lbs. 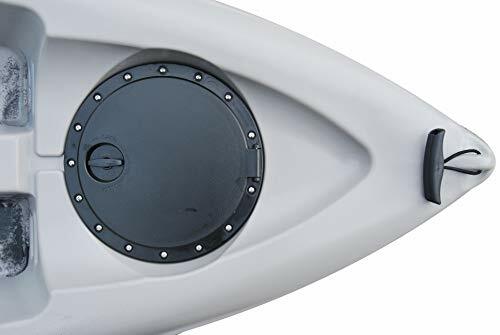 It also has an open and close drain valve, to keep your watercraft dry when paddling. The yak is also easily inflated and deflated. It has five one-way inflation & deflation valves. In addition, it comes with two skegs for more control during tracking and speeding. It seems at the moment, most of the company’s products are branded in one color-white. 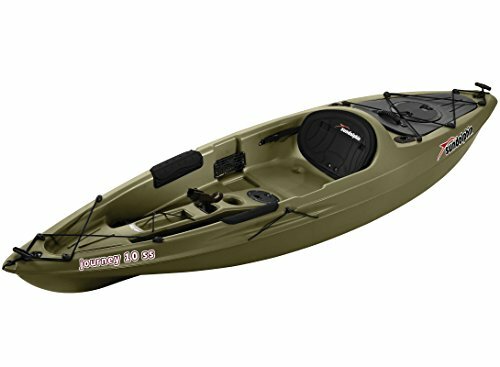 Brooklyn BKC UH-FK184- GRY is a one-person, sit on top kayak that comes with many unique features and accessories. It is designed for stability though it is short. The shape and design of the hull make it almost impossible to tip over. The wide width of 2 feet also contributes to its stability. It is light at 45lbs and can be carried by either one person or two people because it is fitted with four carrying handles. A purchase comes with a lightweight aluminum paddle. This watercraft has a comfortable seat, and the leg room is wide. You can, therefore, fish for long hours with it. It also has elastic bungee cords which serve as paddle parks, which make freeing your hands risk-free. In addition, it has ample storage space which includes two waterproof storage units for keeping all your food, snacks and other personal items safely. The other storage space is in the cargo area which is at the rear of the yak where you can store your cooler, tackle box and fishing gears here. In addition, the yak has five-rod holders, four flush-mounted holders and one articulating rod holder. This feature makes transporting your rods easy. Let the Lifetime-Tamarack yak launch you into the waters. The kayak is designed to track well with its stable flat bottom and deep hull tracking channels. The kayak is constructed from high-density UV-protected Polyethylene. 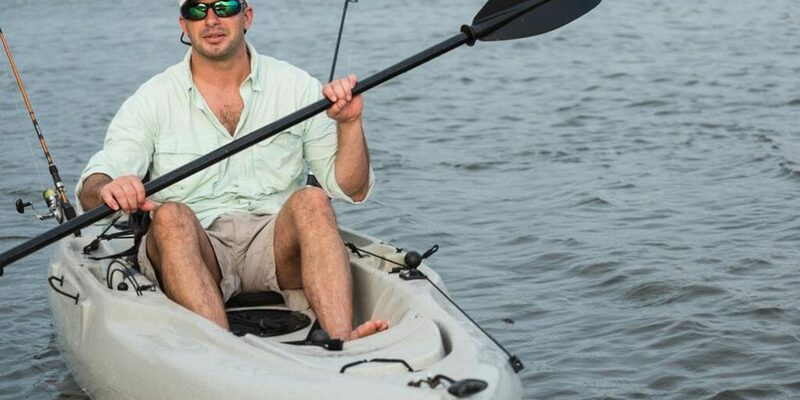 It is a small, one-person sit-on-top kayak that is 10 feet long and has a maximum weight capacity of 275lbs. It is designed with your comfort in mind. It has multiple footrest positions to suit different sizes and heights of persons. In addition, it has an adjustable padded seat. The seat has a back pad and seat pad. The yak also has front and rear shock cord straps. It comes with one top mounting fishing rod holder and two flush-mounted fishing rod holders for your convenience in carrying fishing rods. In addition, it has two storage compartments in the center and rear of the yak. It has rear and front t-handles for carrying it. The yak is quite affordable, and the manufacturer has provided a five warranty backing on the unit. When ordering, you have a choice between getting one with a paddle or without. There is no much cost difference between the two. If your height is above average, this kayak may not suit you. Its length is quite short. The SunDolphin- SS Bali will give you an opportunity to relax and appreciate nature whether your choice is lakes or rivers or both. It is a one-person sit on top kayak that is stable and tracks and paddles well. It is made from high density, rugged, Fortiflex UV-stabilized polyethylene. It is 10 feet long and 30 inches wide. The kayak weighs 44lbs and has a maximum weight capacity of 250lbs. This watercraft has an open cockpit which makes boarding and exiting easy. The deck has a large seating area, which comes with protective thigh pads. The yak also has foot wells for your comfort. The carrying handles and lightweight makes carrying this yak a breeze. The kayak has one paddle holder. Besides that, it has a storage compartment in addition to the Portable Accessory Carrier (PAC), which can be used as extra storage space. The model has six colors to choose from. Unfortunately, all the different colors come with different pricing, with the cheapest being color red. Lifetime-Lotus will give you a fulfilling kayaking experience. The kayak has a well-designed hull for stability and effective paddling and tracking. It is also designed with scupper holes to keep the watercraft dry by draining the cockpit area. 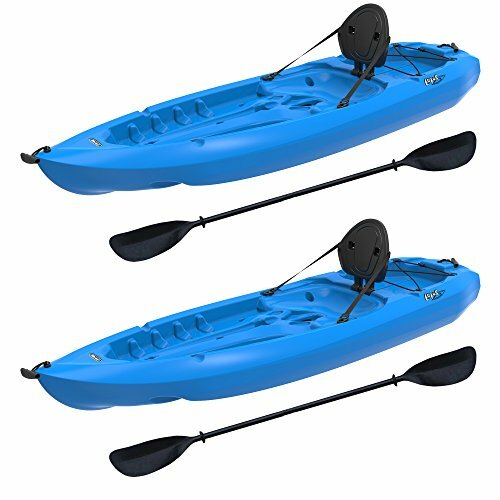 They have two models on offer depending on whether you have a kayaking partner or not. One is a single person kayak, and the other one is a two-person kayak. The two kayaks have slightly different features. The two-person yak is much more expensive than the one-person kayak and comes with a 5-year manufacturer’s warranty. It is constructed from durable high-density Polyethylene. In addition, it has a UV-protection, and therefore it won’t fade peel or crack. It is quite light at 38lbs. The kayak has a hard adjustable backrest and multiple footrest positions to suit different people. The one-person kayak, on the other hand, is much cheaper to buy. The kayak has a polyethylene construction. The seat back is adjustable for your comfort too, and therefore you can paddle for many hours without getting uncomfortable. It has multiple footrest positions. It is also quite portable with its center carry handle. The tank well storage has bungee cord lacing for securing loose items. 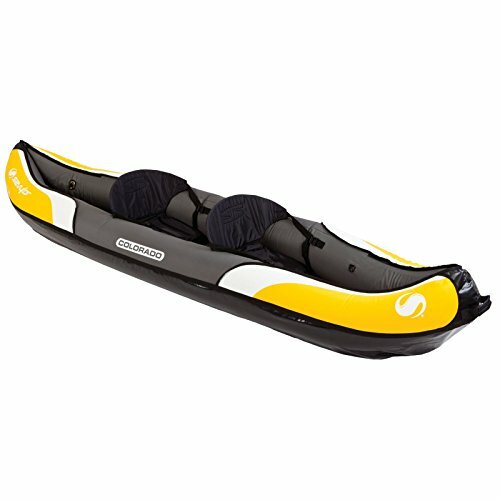 Sevylor-Coleman kayak can take you to excluded places on the waters. This a two-person kayak is constructed from an 8-gauge PVC. It has a 1000D tarpaulin bottom and 840D nylon cover to protect it from punctures. It is light, weighing at 41.2 and its weight limit is 470 pounds. Its dimensions when inflated are 10 feet and nine inches by three feet and three inches. The watercraft comes with a threaded Boston valve for quick and fast inflation and deflation. Mesh storage pockets will come in handy for storing your gear and snacks for easy accessibility. The D-rings make it easy to attaché other equipment. 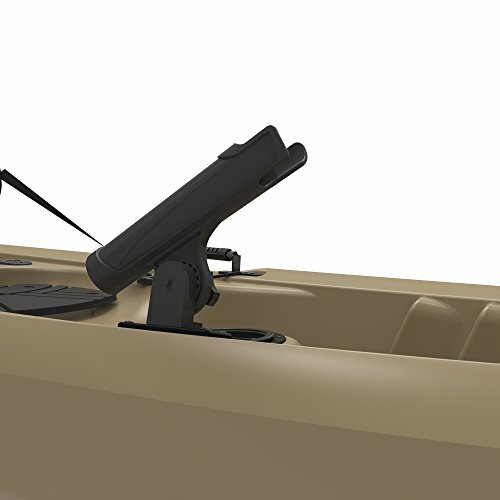 In addition, the yak has rod holders for a guaranteed hands-free free kayaking experience. Multiple air chambers will come in hand in case of a puncture. The kayak also has an airtight system. Just like all inflatable kayaks, it is quite portable, and the package includes a carrying bag for your convenience. The order also comes with a pressure gauge. Threaded Boston valves for quick inflation and deflation. 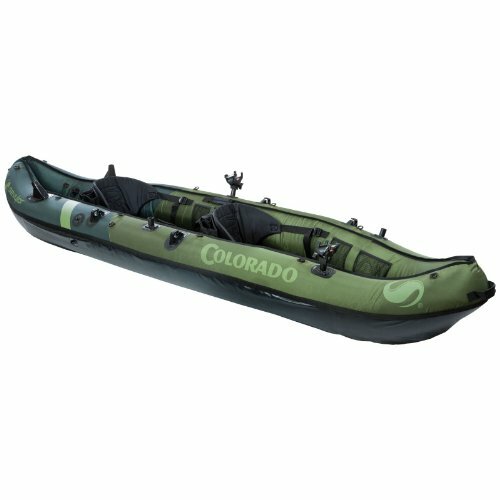 Sevylor-Colorado is an inflatable two-person combo that will give you versatility in your kayaking expedition. 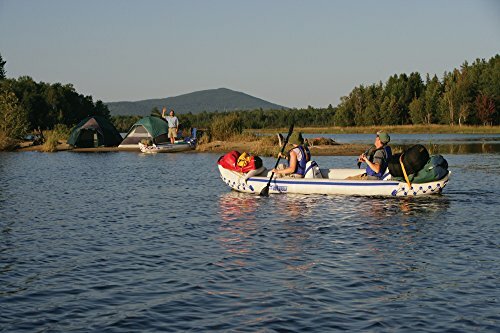 The kayak is designed for rugged use and is constructed with 18-gauge PVC, in addition to having a tarpaulin bottom. It can, therefore, be used in lake and river kayaking. It is a combo and therefore, you don’t need to buy paddles separately. It comes with two paddles for you and your kayaking partner. A package includes the yak, two paddles, a carrying bag, a pump and pressure gauge. The kayak is easy to carry because it is inflatable in addition to having carry handles. It comes with a weight capacity of 470lbs. Setting up the kayak is a breeze with the double-threaded Boston valve that is designed for easy inflation and deflation. Multiple air chambers allow the watercraft to continue staying on the surface even when the yak is punctured. The airtight system also helps to prevent leakages. The D-strings are provided if you wish to attach other equipment. 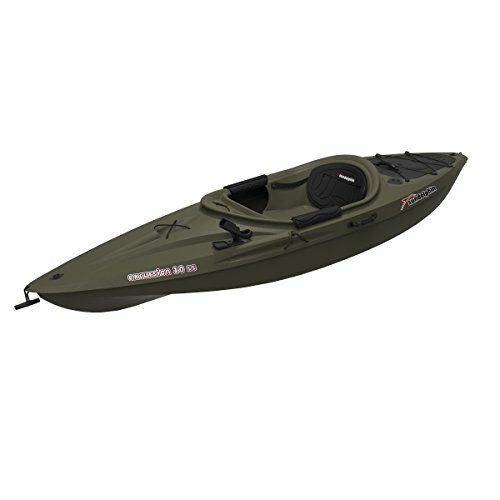 Sundolphin 51495 Excursion is a two-person sit-in kayak that can get you to excluded fishing spots on lakes and rivers. The yak is constructed from High-Density Rugged UV-stabilized Fortiflex Polyethylene. It is therefore strong for lake use. It is 10 feet long and 30 inches wide. It has a weight of 40lbs. The width and construction make this watercraft quite stable, and therefore easy to track and paddle. For your comfort, it comes with a large comfortable seating area, protective thigh pads, and adjustable foot braces. You can, therefore, use it for extended periods of time without feeling crammed in it. 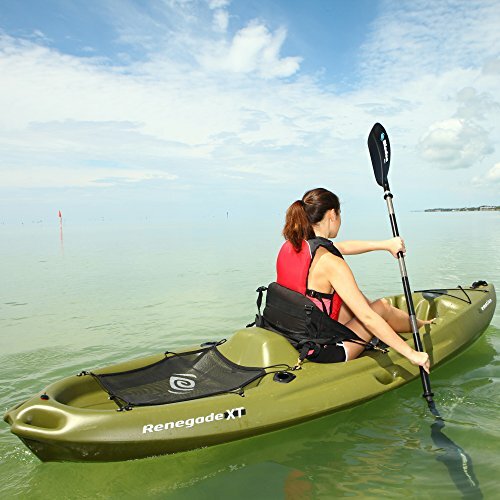 The kayak comes with three-rod holders, one swivel and two flush mount holders. In addition, it has a storage compartment. It also has a shock cord deck rigging, which can be used as storage space. For your convenience, it comes with a paddle holder, to enable you to have a hands-free kayaking experience. The carrying handles and light weight makes it easy to be transported. All this comes at an affordable price. What are some of the key factors to consider when shopping for a cheap fishing kayak? Well, we’d like to say that different fishing conditions and styles can dictate the performance a kayak provides. But at all times, we always insist that one should always put safety first. In that regard, before you settle for any yak, you want to make sure that it’s well-made. It should also meet the basic safety requirements. For instance, it should at least be rotomolded and if possible be of one piece. Besides that, it should be capable of accommodating your weight. And needless to say, it should be comfortable to use even for a long day in the water. Let us now jump into the specifics. Sit-on-tops or simply SOTs are mainly suited for recreational use and work best on easy-flowing rivers and calm lakes. They tend to be easier to manipulate and provide you with a greater degree of navigational freedom. On the flip-side though, their cargo space is typically limited and hard to access. Sit-in kayaks, on the other hand, are preferred by people who like speedy. Also, they come with spacious cargo compartments along with large open cockpits. However, they’re slightly difficult to maneuver compared to the SOTs. Although, they’re still pretty easy to maneuver once you learn the ropes. The kind of surface you plan to use your kayak in can determine the best choice to settle for. Planning to fish in a local lake? If the weather is warm and the waters calm, a SOT kayak would be your best bet. Thinking of exploring the coastal areas? Well, you need to be mindful of the tides, currents, waves, and winds. Therefore, it’d be wise to go for a sit-in yak. Lastly, if you’re planning to fish in a river with many technical rapids, you should always go for a watercraft that’s stable, sturdy and capable of turning quickly. It’s always a good idea to go for a kayak that’s light in weight and generally easy to carry around. With less weight to worry about, you can focus on making your trip more stable and comfortable. The only downside is that lightweight, high-quality materials tend to raise the cost significantly. The cheapest material is the polyethylene plastic. It is abrasion- and UV-resistant although it’s heavier than the other material options. The ABS plastic is slightly lighter than polyethylene though not as rugged. Most high-end yaks feature a composite material. This typically is a combination of fiberglass and carbon-fiber. Not only is this kind of combination light in weight but also pretty durable and reliable. How many people do you intend to bring on board your kayak? Well, if you’re planning for a solo trip you can always settle for a single person kayak. However, if you might consider visiting a few buddies along, go for something with at least 500lbs in weight capacity. Narrow and long kayaks are generally easier to maneuver – and also tend to move faster. The opposite is true for yaks that are wider and shorter. That said, shorter and wider kayaks provide more stability. In general, we recommend 8 feet to 13 feet long kayaks for fishing in calm waters, creeks, rivers, and small lakes. However, if planning to go for huge rivers, lakes or anywhere with choppy waters, we’d suggest settling for the 14 to 18 range of kayaks. Torn between an inflatable and hardshell kayak? Well, maybe a few clarifications will help you make an informed bet. Inflatable yaks are known to be light in weight, easy to carry and capable of bouncing off rocks – therefore, durable. You, however, would need to inflate and deflate it before and after use. On the contrary, hard-shell yaks come ready for the journey. They’re easier to control, durable, and generally stable. On the downside, though, they aren’t particularly light and are pretty difficult to store. For those who love hardshell kayaks, the Journey 10 SS from SunDolphin would be a fantastic choice. It’s great for both rivers and lakes and has a generous weight capacity for one. As for the inflatable yaks, we’d recommend going for the sea eagle SE370 which boasts a 3-person sitting capacity. You’re about to make a big purchase now that you’re preparing to get yourself a kayak. But never should you ever judge any yak merely by its looks or price tag. Look even closer and you’re bound to discover a lot more. Hopefully, the reviews above will help you make just the right decision going forward. Happy ‘yakking!